Allow us to act as your "link" to the live music experience. The ASO is working to enrich the quality of young lives in our area, engaging the audiences of tomorrow through educational programming and hands-on activities. Students in grades 3-5 discover how composers create musical movement using elements such as motif, melodic direction, steps and leaps, dynamics, and orchestration. Exploring a range of orchestral repertoire, students sing, play the recorder and/or the violin, compose, and perform in a culminating concert in Albany's Municipal Auditorium. Carnegie Hall’s Weill Music Institute’s Link Up program pairs orchestras with area students in grades 3-5 to explore orchestral repertoire through a hands-on music curriculum. Weill Music Institute provides each student with a workbook to use with their teachers. In addition, students learn and prepare songs to perform with the orchestra at the Link Up concert during the school day. Join us for an educational musical event on Saturday, December 8, 2018! 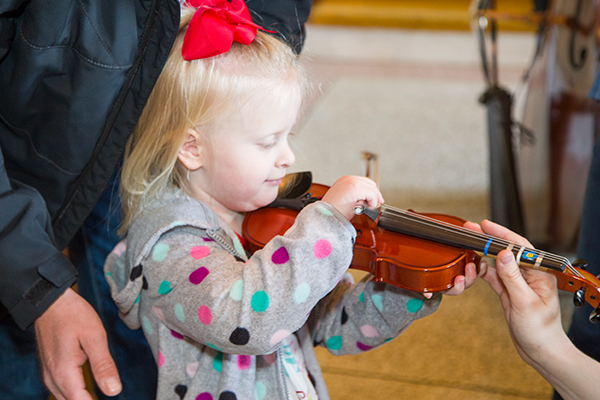 Beginning at 10am, before our 11am condensed matinee performance, our professional musicians (and their instruments) will be available for your children’s enjoyment. This is a great hands-on opportunity and a powerful way to introduce young children to a variety of instruments.